Thank you for your letter of June 19th regarding our "Renaissance Faire" Barbie product. We here at Mattel are highly attuned to gender stereotypes and are committed to historical accuracy. 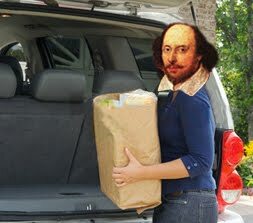 Please note that we have for purchase the "Shakespeare Barbie Purse Rod and Reel Kit" (shown below). We believe that there are little Ophelias everywhere who are dying to do things little boys do. And just think what the original Ophelia could have done with that securely latched waterproof purse! All-in-one telescopic rod and reel with line. Clear zippered purse with security latch. Complete with tackle box and sunglasses. Practice casting plug. BARBIEPURSE BARBIE and associated trademarks and trade dress are owned by, and used under license from, Mattel, Inc. © 2011 Mattel, Inc.